Self Running Data DVD. Simply Pop in your drive and Go! Self starting Menue system click the Book you require. Simple to us menue system. Easy to Print Easy to use. If you Repair Brigs Engines Then this is for You. Briggs and Stratton Carburetion Troubleshooting & Repair Procedures 1996. Briggs and Stratton DOV 700-750 Series repair manua. Briggs and Stratton Electric Motor service manual. Briggs and Stratton Gas & Electric Outboard Repair Service. Briggs and Stratton Generator Troubleshooting. Briggs and Stratton Hand Held Generators Trouble shoot. Briggs and Stratton Micro Engine Service Repair. Briggs and Stratton Power Pack System Repair. Briggs and Stratton Pressure Washer Pumps by Generac Troubleshooting. Briggs and Stratton Resistance Tables Supplement. Briggs and Stratton Single Cylinder L-Head Workshop Manual. Briggs and Stratton Single Cylinder OHV Workshop Manual. Briggs and Stratton Twin Cylinder L-Head repair manual. Briggs and Stratton Twin Cylinder OHV Service Repair. Briggs and Stratton Two-Cycle Snow Engine Service. Briggs and Stratton Two-Cycle Vertical Engine Service Repair. Briggs and Stratton Vanguard 3-Cylinder OHV LC Diesel Servic. Briggs and Stratton Vanguard Single Cylinder OHV Service Repair. Briggs and Stratton Vanguard Twin Cylinder OHV Service Repair. Briggs and Stratton Vanguard Twin Cylinder OHV LC Service Repair. Briggs and Stratton Alternator Identification Chart MS-2288FL_LR 7-09. Briggs and Stratton alternator_replacement with wiring diagrhams. Briggs and Stratton Belts failure book final CE8149. Briggs and Stratton Check Chart common_specs metric all engines. Briggs and Stratton Digital Multimeter Instruction Manual MS6574. Briggs and Stratton Familiarization & Troubleshooting Guide Portable Generator. Briggs and Stratton Generator Resistance Tables rev 7. Briggs and Stratton ignition_wiring basic wiring diagram. Briggs and Stratton oil_capacity chart. Briggs and Stratton Out oard Service and Repair Manual. Briggs and Stratton Single cylinder ohv repair manual. Briggs and Stratton Trouble shooting flow chart. Briggs and Stratton Troy Bilt pony Intek engine replacement. COMMON SPECIFICATIONS FOR ALL BRIGGS & STRATTON TWIN CYLINDER ENGINE MODELS. COMMON SPECIFICATIONS FOR BRIGGS & STRATTON ALL SINGLE CYLINDER INTEK ENGINE MODELS. COMMON SPECIFICATIONS FOR BRIGGS & STRATTON ALL SINGLE CYLINDER L HEAD ENGINE MODELS 270962. COMMON SPECIFICATIONS FOR BRIGGS & STRATTON ALL SINGLE CYLINDER OHV ENGINE MODELS EXCEPT INTEK MODELS. COMMON SPECIFICATIONS FOR BRIGGS & STRATTON INTEK V-TWIN OHV ENGINES. COMMON SPECIFICATIONS FOR BRIGGS & STRATTON VANGUARD OHV V-TWIN CYLINDER ENGINE MODELS. No ther Seller has this manual set Only available from me! 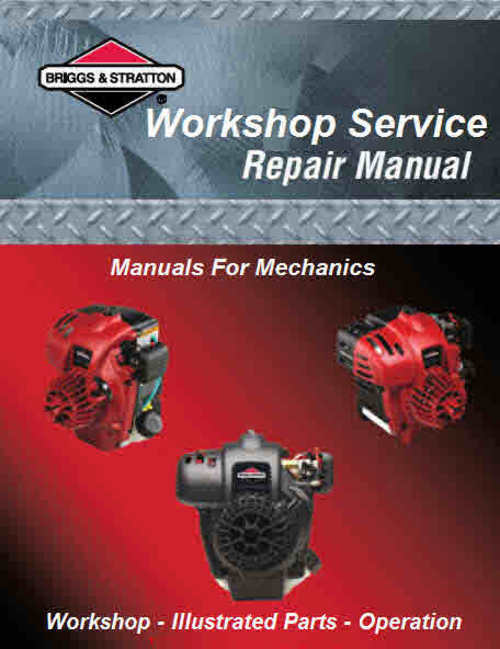 Briggs and Stratton Service Manuals for Mechanics briggs and stratton 279533574 16.99 richo Fresh Download Available!